What started out as an easy little kayak trip on a Sunday morning became a memorable, spectacular, physically demanding adventure. I have recently purchased my first boat—a red Necky Dolphin Sit-On-Top Kayak—and want to take it on a maiden voyage to test it out. A couple of friends from Gainesville and I decide to do a paddle on the Santa Fe River. The idea is to decide on the route at the last minute, and the fateful decision is made to do a section of the river that none of us have paddled before. Because I live for adventure, I leap at the chance to try a section of a river that I have never seen before, though I have done downstream sections several times in the past. The river guidebook issued us a warning that the difficulty level of this upper section was "strenuous" and that the "determined" person can paddle the stretch when the water level is average or high. Recklessly and without realizing what we were getting ourselves into, we proceede to a put-in point at Worthington Springs. As the guidebook mentions, this put-in point makes the river appear deceptively navigable, because it is fairly wide and free of obstructions. It is only downstream when you are faced with the challenge of relentless blockages. We perhaps should have heeded these warnings, but we choose not to. It is a trip we will never forget. It was the "Death March" to end all death marches. We enter the water with our kayaks at about 10:45 a.m. Quickly, the river transitions into a narrow channel. For the first 4-5 miles, we paddle, force, fight, skirmish and battle our way, for the next 5 hours, through Confusion Willow Swamp. It seem as if every single tree along the river bank has fallen into the river, forcing us to portage every few minutes over logs, branches and sand. (We must have portaged about 80 times on this grim day, and it was extremely fortunate for 2 of us that we had sit-on-top kayaks, since that made the portaging more tolerable.) It is, by far, the most technically demanding paddle I have ever encountered. The photo below shows us at one of the sand bars we must portage over. I come to learn my new kayaks' capabilities quite intimately. My assessment is that the kayak is quite responsive and impressive. What a way to break in a new boat! I put it to the extreme test. It must successfully navigate over logs, limerock, branches, and sand. The bottom of the boat becomes severely scrapped up by the sand and sharp limerock as we crawl through very shallow water, and she accumulates a lot of mud and debris on the deck. Despite the difficulties of Confusion Willow Swamp, I am stunned by how gorgeous, pristine, quiet, and peaceful this stretch of the Santa Fe turns out to be. There is nearly no development along this stretch. I notice that the trees and branches do not appear to have been broken through by paddlers before us, so it appears that we are part of a very rare and small number of pioneering paddlers who had ever struggled through this section—especially at such a low water level. It makes for a special feeling of being "explorers" of uncharted territory. Along the way, I take on a large number of big spiders that decide to hitch-hike onto the kayak and my face. I spot a large owl perched in a tree. We also see deer, snakes, great blue heron, several otter, large pollywogs, and some big splashes that I assume are fleeing alligators. Indeed, at one portage over a sand bar, I see 5 baby alligators in a small pool of water, which is unsettling because we then wonder where Mommy and Daddy Gator are lurking. Near a cattle pasture, we have a big, black cow get scared and run away from us. Her escape is blocked when she gets caught in a barbed wire fence that she crashes into at the riverbank. Near the end of our skirmish in the Swamp, we start running out of water and food—not having previously planned on such a long and demanding trip. (We have also neglected to let friends know where we would be and when we expected to emerge, thereby breaking another survival rule.) Finally, after 4-5 hours, the river lets up on it's relentless, nearly unnavigable obstructions condition. But now it is nearly 5 p.m., and we are only half-way to the take-out point. We face a very wide and boring section of the river, and a strong headwind. Our energy is spent to the point that our earlier discussions about urban design and politics has ceased. We were now in Maslow's "survival" level of his hierarchy, and dispense with any behaviors that would not go toward survival. We have become "Punch Drunk" and are laughing hysterically and uncontrollably because of it. Had we taken out just after the tree-obstructed section, it would have actually been an extremely enjoyable paddle for me. But the last 4 hours in open water—with no water for sustenance—is a challenge. My hands become blistered, and I am needing a break every 5 minutes or so during our relentless paddling through the headwind to recharge my body. At one point, we made the wrong turn at a fork in the river, and are forced to backtrack along that spring-fed branch—the last thing we need to do with our energy so depleted. At approximately 8:30 p.m., we finally reach our take-out point at O'Leno with daylight rapidly fading into darkness. At 10:30 p.m., a friend is kind enough to feed us a pasta dinner and plenty of cold water. That night, I sleep soundly. Because the river is so technical and attractive, I plan to return when water levels are higher—despite how physically demanding the experience was. The Upper Santa Fe River is a hidden gem in Alachua County. I am startled that I have lived nearby since 1986 without knowing of its existence. I would say that it rivals Juniper Springs and Ichetucknee Springs in beauty for Florida rivers. The river is fed by over three dozen springs, many being first-magnitude. The river has been declared an "Outstanding Florida Water." In 1987, KBN Ecological Consultants were hired by Alachua County to conduct an ecological inventory of significant natural areas. Santa Fe River was ranked the most significant ecosystem in the county. This study refers to it as a near-pristine blackwater river, containing the county's best floodplain communities, containing many unusual species, and a critical regional ecosystem linkage. 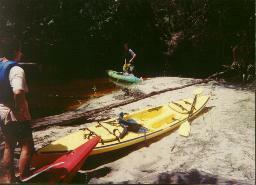 "The river has its headwaters in Santa Fe Swamp, an immense Okefenokee-like bog in the northeast corner of the county. This nearly impenetrable thicket is a very important wildlife area with good habitat for bears and alligators. The upper part drains flatwoods and therefore carries clear, dark, acidic waters. There are several reptiles and amphibians, including the canebrake rattlesnake. The Santa Fe's floodplain swamps and forests are the only examples of these communities in Alachua County and among the best in peninsular Florida. At O'Leno, the river goes underground and emerges from the limestone [3 miles later at River Rise State Preserve, thus forming a natural bridge] as a much larger and more calcareous stream dominated by clear spring water. This stretch is the southeastern limit for the American beaver, alligator snapping turtle, red-bellied watersnake, and spotted bullhead. The redeye chub, Suwannee bass, and Suwannee cooter are found only in the streams, springs and spring runs of this region. Following the reemergence of the river, well-known springs such as Darby, Hornsby, Poe, Allen, Blue, July Ginnie and Columbia feed the river. Later, Ichetucknee Springs joins the river. The river basin contains nearly every plant community type known in the north central Florida area. Oak and cypress grow along the banks, with pine forests growing in the uplands."